For thinning seedlings and weeding. The blade is made from spring steel. 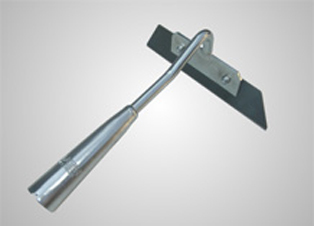 It can be used to loosen the soil and to cut weeds under a cabbage or a lettuce in an advanced stage of growth. The pointed ends of the blade make thinning rows of seedlings easy and fast. The angle between blade and handle encourages working in an upright position.